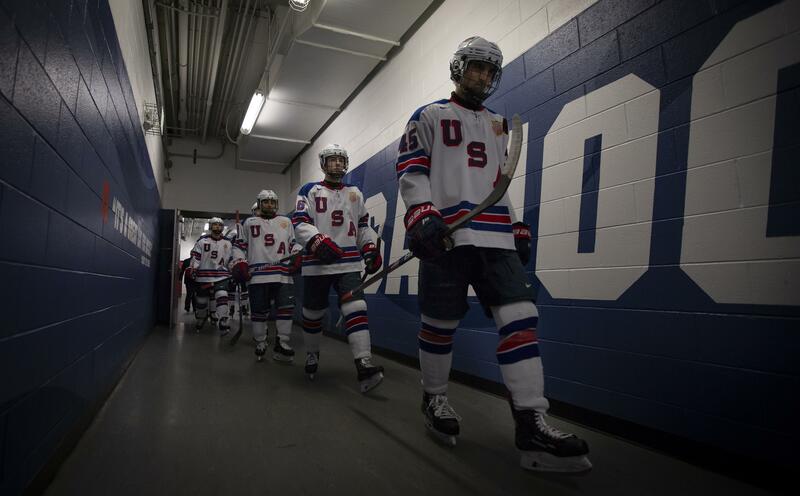 PLYMOUTH, Mich. - Thirteen forwards, eight defensemen and two goaltenders have been selected to join USA Hockey’s National Team Development Program and will compete as the U.S. National Under-17 Team in 2019-20 it was announced today. The 23 players – all from the 2003 birth year – come from 14 different states. NOTES: Of the 14 states are represented on the roster, Michigan leads the way with four natives. Minnesota follows with three, while Arizona, California, Florida and Illinois all have two players. Colorado, Connecticut, Massachusetts, Missouri, New York, Ohio, Pennsylvania and Virginia each have one player … Nineteen players have verbally committed to play NCAA Division I college hockey … Defenseman Luke Hughes (Canton, Mich.) and forwards Justin Janicke (Maple Grove, Minn) and Sasha Pastujov (Bradenton, Fla.) all have brothers who graduated from the NTDP (Quinn Hughes, Jack Hughes, Trevor Janicke, Michael Pastujov, Nick Pastujov) … Forward Tyler Boucher (Scottsdale, Ariz.) is the son of Brian Boucher who spent parts of 13 seasons as a goaltender in the NHL … Caden Brown (Chesterfield, Mo.) is the son of Jeff Brown, who spent parts of 12 seasons as a defenseman in the NHL. He is also the brother of Logan Brown who is a forward with the Belleville Senators, AHL affiliate to the Ottawa Senators … Colby Saganiuk (Valencia, Pa.) is the grandson of Rocky Saganiuk, who spent parts of six seasons as a forward in the NHL … Redmond Savage (Scottsdale, Ariz.) is the son of Brian Savage, who spent parts of 12 seasons as a forward in the NHL … Ryan St. Louis (Riverside, Conn.) is the son of Hall of Famer Martin St. Louis, who spent parts of sixteen seasons as a forward in the NHL.